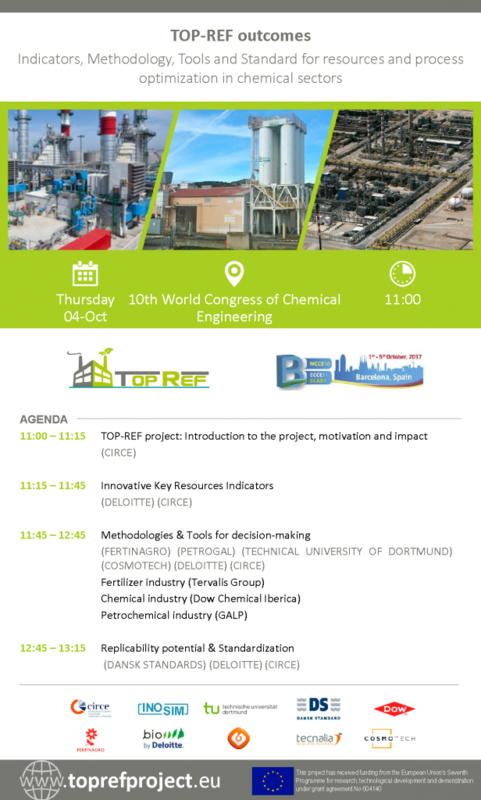 Barcelona is hosting a new edition of one of the largest events of the chemical sector worldwide: the celebration of the 10th World Congress of Chemical Engineering together with the 11th European Congress of Chemical Engineering and the 4th European Congress of Applied Biotechnology. In this context, TOP-REF has organized a specific workshop to present its main outcomes. The conference Indicators, Methodology, Tools and Standard for resources and process optimization in chemical sectors will show to the audience the methodologies and key resources indicators that the project has developed to improve energy efficiency in process industries. The event will take place the 4th of October at 11:00. Here there is a brief summary of the agenda., which is also available for download in the following link.